Cambodia’s recent suspension or ‘postponement’ of military exercises with the United States has in some ways come as a surprise and in another sense isn’t surprising at all. For several years Cambodia has been ‘playing the field’, seeking to capitalise on its relations with China and the US, among others, to best suit its interests. Only this time, Hun Sen may feel he has greater leeway than ever before in snubbing the Americans without worrying much about negative consequences. Cambodia has long been a beneficiary of Chinese largesse, in part because of China’s antipathy towards Vietnam dating back to before the Sino-Vietnamese War of 1979. Today, the bonds between them are closer and stronger than ever . China is Cambodia’s top foreign investor, a major donor (outstripping the United States in investment and aid several times over) and an increasingly important trading partner. In recent years, China has been assisting with training matters and provision of defence equipment but with no strings attached other than a requirement to be supportive of China in international affairs. The Chinese Foreign Minister’s visit to Cambodia on 21 August , marking the 55th anniversary of the establishment of diplomatic relations, adds symbolism and substance to the Comprehensive Strategic Partnership of Cooperation between the two countries in 2010. China has emerged as Cambodia’s most significant military benefactor, recently signing a memorandum of understanding on military training, helping to significantly expand the Cambodian forces’ training capabilities, hosting dozens of Cambodian military students on courses in China and providing a range of significant items of military equipment including helicopters . Last year, Cambodia duly complied with China’s bidding in blocking a resolution at the ASEAN Summit which could have proven to be inimical to China’s claims over the South China Sea and its desire for dealing bilaterally rather than multilaterally with respective rival claimants. After all, China has a much stronger position over the South China Sea if it can keep the affected ASEAN countries from acting collectively and particularly from acting with the full support of a united ASEAN. The US has also been a supporter of Cambodia. 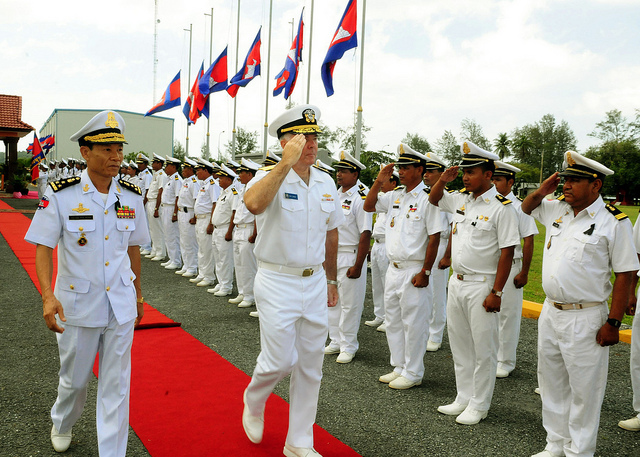 It’s rendered extensive training for Cambodia for counterterrorism and UN peacekeeping missions in places such as southern Sudan, Chad and Lebanon as well as making routine US Navy port calls and conducting low-level bilateral naval exercises. Hun Sen’s own son, Lieutenant-General Hun Manet, is a graduate of the United States Military Academy at West Point and is seen as a key ‘in’ for the United States in Cambodia. Much has been riding on its investment in Cambodia, although with little to show for it in recent times despite such ties to the ruling family of Cambodia. Part of the difficulty lies in that American support for countries like Cambodia often comes with unpalatable strings attached. As the Indonesians experienced following the crackdown in Timor-Leste, the United States can make unpleasant demands on its clients. On cue, elements of the US Congress have been critical of Hun Sen and the reported electoral fraud  that saw him return recently for yet another term in office after nearly three decades in power. The US State Department has called for an investigation , severely irritating Hun Sen.
Cambodia was expected to receive US$1 million from the State Department’s Foreign Military Financing (FMF) program this year. This compares with tens of millions of dollars of military aid from China for building facilities, supplying military equipment including uniforms, vehicles and patrol boats and much more in non-military aid. In the meantime, Australia, South Korea, France and Japan all maintain modest military assistance programs which appear to remain unaffected at this stage, although two exercises with the ADF have been postponed . Stepping back from the details, you might conclude that this is a relatively minor spat by Hun Sen over what he sees as the US’s haughty and intrusive approach to Cambodian affairs. In this instance, it’s Hun Sen and his government that has raised blockages, not the United States. And with China eager to play off US difficulties, Hun Sen likely feels less inclined to seek reconciliation on anything but favourable terms. In the meantime, there’s little likelihood of a negative reaction in public from other ASEAN countries, with ASEAN’s principles of mutual respect, equality, and non-interference in internal affairs being virtually sacrosanct amongst its members. If anything, they’ll note the relative ease with which Hun Sen was able to dismiss what he might describe as sentimentalist and intrusive American views. This incident has put the spotlight on a significant emerging constraint on US hard and soft power as it seeks to rebalance towards Asia. Once upon a time, countries like Indonesia worked hard to overcome obstacles to renewed military-to-military engagement. A number still see the benefit of staying on side with the Americans. However, Cambodia now feels that it isn’t so obliged: it has other options. Not only is China happy to contemplate filling the gaps but other donor countries remain ever more sensitive to inadvertently unbalancing precarious bilateral relations. Others in the region will be taking note. John Blaxland is a senior fellow at the Strategic and Defence Studies Centre at the Australian National University. Image courtesy of Flickr user US Navy .